I hate winter. As a Texan, this is sacrilege. We’re all supposed to hate the heat (even though we choose to live in this state. Sigh.) The last couple of weeks have been plunging us into autumn, and we’ve already had our first hard freeze. Oh, I loathe it. Anyone who likes sitting on the back porch watching the sunset, reading, and writing would succomb to grief at the onset of the cold. I’d rather be sitting out here in the blazing sun with a cold drink and sweating all the while. I know, I’m a bit off. I sat one evening watching the sunset and the leaves fall on a warm autumn day, and I wondered how I would handle winter this time. Last winter was not so good. I couldn’t go outside as much, and that fact alone wearied my soul. I need sun and the soothing balm from vitamin D that comes along with it. Oh, my family was great, I had a job, and my kids were, will always be, a gift. I had much for which to be grateful. What I mean to say is that my emotions and focus took a nosedive, and it was a darker time for me. Sometimes winters can be long. The first shot of cold is a shock, and maybe even exciting, but then one drudges along through the remaining cold days. It is a surprise each cycle of the seasons to see the trees bare and lifeless. I find myself longing for other seasons. And so, when the last winter arrived my usual apprehension about the coming cold combined with the loss of my grandmother and angst about my job to create an even longer winter season. And yet, I kept moving on because this is life. We breathe even as breath passes away from another. We rise out of bed with aching hearts, but still, we breathe and we move. Since that winter more family members have fallen asleep in the Lord. My boys have gone to four funerals in 16 months. I have gone to more, but I lost count. The seasons march on despite any protests. And so, we are in the last stretch of autumn and I feel dread about the upcoming winter. Will I capitulate to the fear and anxiety? Will I give up my routines and schedules to fall prey to the malaise of ennui? Will I forget that I have so much for which to be thankful? Or, will I get up and move and breathe? Cycles of time feel bittersweet but necessary. The fall leaves tell a story about letting go. And this fall my parents and my aunt and uncle are in the process of physically letting go. It is time to clear out my grandparents’ house and put it up for sale. To that end, we had an estate sale in early November. I made it into town for a small part of the work. My family and I moved furniture and put up price signs all over my grandparents’ house. With the rain in the prior months, the yard looked greener and fuller than I ever remember it being as a kid. It seemed out of place with the clouds and crisp chill outside. It also seemed somehow wrong to have signs all over the yard. How does one sell the past? How can it be that we keep having to say goodbye a hundred times over? Even so, I moved and I breathed. As I walked inside I had to pass by a rather large “Sale Inside” sign. Again, I kept walking. We lit the gas heater in the bathroom which was enough to make it livable with a jacket on but not really comfortable. We laughed, told stories, and, in between, practically begged people to take the possessions that remained. My dad tried to sell an old-fashioned salon hair dryer. One I never knew my grandmother had. He didn’t find a taker, but we sold most of everything else. I almost didn’t breathe or move. As I drove up the night before the sale, I felt my throat constrict and my eyes redden with tears. It was involuntary and unbidden. My parents, as well as my aunt and uncle, have been over to my grandparents repeatedly since my grandfather passed away. Bills had to be paid, drawers cleaned out, and lawns mowed. I had avoided all of that. Instead, I found it difficult to even darken the doorway after my grandmother was gone and my grandfather still haunted the halls. Certainly, I hadn’t seen it in the current state without any living souls. Shades of the former occupants could be found all around, and I felt as if I was moving in their shadows. Already so much had changed. Some of the furniture had been claimed by family members and moved out. What remained was pulled off the shelves, out of closets, and from cabinets. We placed these things on long tables my mom had brought. I never cared for most of the knick-knacks my grandmother collected. If I ventured a guess it wasn’t so much that she collected them as that she kept watch over the gifts people gave her. A well-loved grandmother receives little treasures from family and friends alike. In the midst of giving away and selling furniture, I also ended up with a bedroom set from my grandparents’ guest bedroom. A week after the estate sale, I began the long process of moving my makeup and hair supplies to the vanity my grandmother kept in her guest bedroom. Apparently, she used those drawers more than I realized. One drawer had not been emptied. I found a photo button of my cousin, odd knick-knacks, bobby pins, and fingernail files. In the end, I took what wasn’t salvageable in the drawer and dumped it in the trash. I don’t know how we become so attached to our things, but at that moment I again felt that everything here comes to an end and matters little. Death does not play favorites. There was an exception to dislike of her knick-knacks. In the office where she spent 39 years as a secretary, she kept a Russian nesting doll that a student or faculty member had given her. As children, my sister and I took it apart and examined it endlessly. When she was gone, I kept asking about it and said if I only had that from my grandparents’ things, I wouldn’t need or want anything else. It represented my grandmother to me. As a secretary for the School of Music at a local university, Meema often received exotic gifts from students or faculty as they traveled on summer breaks or studied abroad. That little doll set was one such a treasure and it fascinated me and became a way to transport back to those days when my sister and I watched music students come in and out of the office, walked to Moody for snacks, and spent afternoons at the university pool. I don’t know if I knew how special it was back then, but she also let us wander around Caldwell Hall. I remember going upstairs and finding a piano practice room to try out our playing skills. Sometimes I had the impression we weren’t really allowed to explore those rooms with such abandon, but I don’t think my grandmother could deny us. She loved an adventure, big or small. 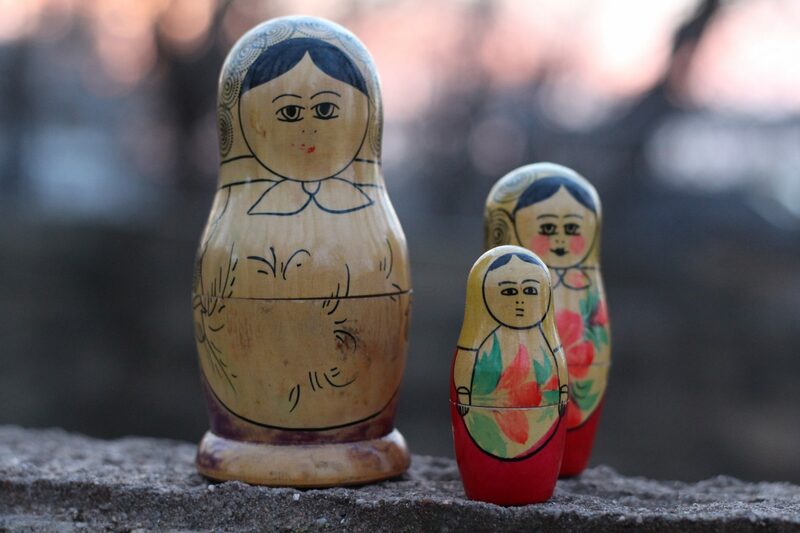 All that memory and emotion just from a Russian doll set. Yeah, I wanted that one. Though I ended up with other items, no one could find the doll. Finally, as I dropped my boys off at my parents’ to then head over to the sale preparations, I looked over Jake’s shoulder as he picked up an item and exclaimed, “I remember this!” My eyes fell upon the doll, and I screamed and squealed. The boys thought it funny because I’m not exactly expressive about physical items, well, unless it’s coffee or a book. By some miracle, my mom had discovered it hidden on a bookshelf. A million emotions washed over me — surprise at its sudden appearance, relief that it was found, grief that it could be mine now only because she was gone. That weekend I ended up claiming a few more items that had belonged to my grandparents. I’m not sure how much she loved shelling pecans, but I know she liked eating nuts of any kind, and she made a marvelous pecan pie. We found her pecan cracker. No one seemed inclined to take it, so I put it in the pile to go home with me. I could see her hands pulling a nut out of a shell and handing it to one of us. We all ate pecans that way. It was one of the things many of us grandkids did with Meema. There is a pecan tree in my backyard now. Maybe I will carry on the tradition. In an effort to display the various paintings and wall hangings, no one claimed but needed to be sold, we started placing items in the hallway. First, the family photos had to come down. My cousin started this task and perhaps thought nothing of it. Only the late hour and the need to get the job done kept me moving. Some of those photo frames had been hanging in the same spot since before I was born. It was as if my hands were not a part of my heart at that point. I stopped briefly here and there just to breathe. I kept moving. People instinctively know that an image of a human being has something sacred about it. I am always a bit shocked to see a face scratched or cut out on someone’s family photo. There were no scratched out faces in my grandparents’ hall gallery. Exes, the missing, the adopted—they all resided in my grandparents’ hearts and so everyone, loved and troubled and forgotten by others, graced that hall. With all those faces peering out at me, I could only mechanically pull one down after the other. They too went in a pile, and I knew like so much else they would fade. They would fall to the earth and become nothing more than dust. Time marches on. These experiences and remembrances do not happen in a vacuum. Not all is lost. Not all is sorrow. Winter whispers seasons of joy and already holds the seeds of renewal. As we near the time of The Nativity, the Incarnate Word gives a deeper meaning to the advance of time. The God-Man redeems all of life, the grief, and the joys. Because Death ravages all our lives, Christ dwelled among us transforming every part of human existence from birth to death to life again. The culmination of our redemption in Christ comes not with His Death and Resurrection but with His return when all shall rise and meet the hope we only see whispers of in this life. So our hearts long for the redemption of the whole world, for the seasons of sorrow and grief to be destroyed. Memories of death intertwine with visions of birth. And it begins mysteriously in this season of Incarnation when a Baby born to hang on the Cross comes in the flesh. Loved the memories. So timely.